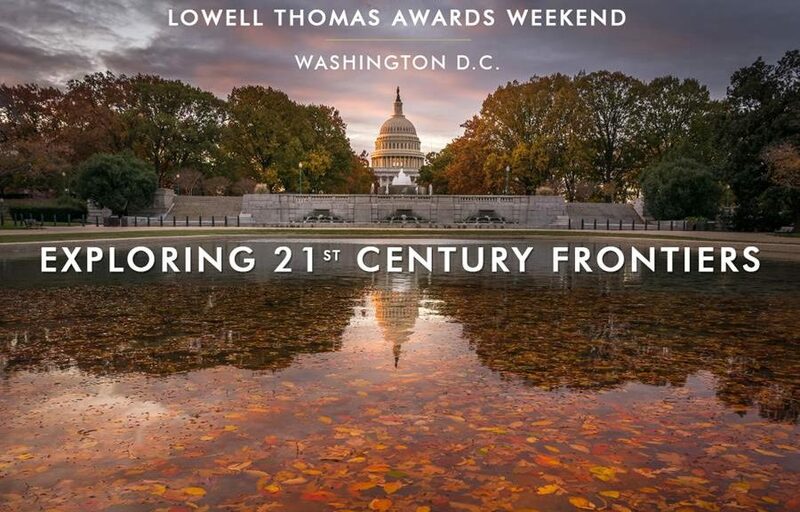 The Explorers Club Flag and Honors Committee has selected Scott Wallace, FN ’07, an ECWG member, as one of four recipients of 2012 Lowell Thomas Awards. 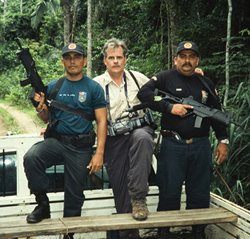 Two Brazilian policemen guard Scott Wallace in the Amazon. “Scott is an excellent candidate who personifies the concept of mindfulness and has done so over two decades with numerous expeditions and publication of those findings,” says ECWG member Michael J. Manyak, MED ’92, a member of the Flag and Honors Committee. “He is a true champion for preservation of indigenous culture and biodiversity and has brought awareness of these issues to the public domain repeatedly. His work is the essence of exploration and he should be recognized by our organization for those contributions,” Manyak said in his letter of recommendation for the Award. Wallace is a writer, photographer, producer, and speaker whose assignments have taken him from the streets of Baghdad and the Himalayas to the Alaskan Arctic and the depths of the Amazon. David Hempleman-Adams, whose many accomplishments include being the first person to reach the Geographic and Magnetic North and South Poles as well as climb the highest peaks in all seven continents. Bill Thomas who has spent more than 20 years going into Papua New Guinea each summer to work with indigenous cultures. The United Nations Educational, Scientific and Cultural Organization has recognized him for developing ways to use indigenous knowledge to predict the impact of human activity on biodiversity. Wallace is a frequent contributor to National Geographic and a former correspondent for Newsweek and the Guardian, and his writings on armed conflict, international organized crime, the environment, and vanishing cultures have appeared in Harper’s, Smithsonian, National Geographic Adventure, National Geographic Traveler, Condé Nast Traveler, and Grand Street. His photography credits include Smithsonian, Outside, Details, National Geographic Traveler, and Newsweek, and he has shot and produced for CBS News, CNN, and National Geographic Channel. At the ECWG’s Nov. 19, 2011 Cosmos Club dinner Wallace told the story of his National Geographic assignment in the summer 2002 to journey deep into the Amazon with the renowned Brazilian explorer and Indian rights activist Sydney Possuelo to gather information on an uncounted indigenous group known as the “People of the Arrow” without making contact. Wallace tells the expedition’s story in his book The Unconquered: In Search of the Amazon’s Last Uncontacted Tribes. “His book had me itching to retrieve my boots, bug juice, and passport to head out the door,” Manyak says. Early in his career, Wallace took numerous journeys into remote jungle areas of Guatemala, El Salvador, Nicaragua, and Honduras. These trips documented the troubles of the indigenous tribes as they fled into mountainous remote jungle to avoid government-sponsored violence. In the 1990s, he traveled deep into boreal forests in deep winter along the Great Whale River and Le Grande River in Quebec’s Far North to document the impact of hydroelectric construction on Cree Indian’s subsistence hunting way of life. Publication of the Cree’s opposition helped kill the $19-billiion contract between Quebec and the New York Power Authority. In 2001, on assignment for National Geographic, Wallace accompanied a Venezuelan fact-finding expedition into the remote Upper Orinoco Valley to investigate charges of misconduct perpetrated by Western scientists among the primitive Yanomami Indians. This resulted in the definitive account of the so-called “Chagnon Controversy,” published in National Geographic Adventure, in April 2002. The two-part television series he produced for National Geographic Channel on the challenges ahead for the Yanomami as their ancient culture comes up against the frontier of modernity is very highly regarded. Though heavily concentrated in Amazonia, Wallace’s activities have encompassed other distressed areas. In 2004, he circumnavigated the globe for the World Bank to document Bank-financed development projects with visits to Peru, Colombia, Brazil, Morocco, Senegal, Mauritania, Tanzania, Eritrea, Yemen, Bulgaria, Turkey, India, Bangladesh, and Thailand. This resulted in a publication on World Bank’s Development 360 website and exclusive photographs available in World Bank Image Collection which depict poverty alleviation, women’s empowerment, rural road construction, rural education, girl’s education, labor and commerce. Also in 2004, at the behest of NGS, Scott accompanied George Schaller on a two-month expedition through the Grand and Small Pamir of Afghanistan’s Wakhan Corridor, all the way to border of China on foot, horseback and yak. This expedition conducted a census of Marco Polo sheep as a prelude to creating a four-nation peace park to protect and manage the species as well as to give local shepherds incentives to protect the animals. This resulted in publication of “The Mega-Fauna Man” in National Geographic Adventure, a profile of Dr. Schaller’s work (Dec. 2006). Scott traveled for The Smithsonian in 2005 to the southern rim of the Arctic National Wildlife Refuge (ANWR) with Gwich’in caribou hunters and to Inupiat Eskimo villages on North Slope of Alaska to document the growing schism dividing Native Alaskans over the issue of oil drilling in ANWR. His publication of a major story “ANWR: The Great Divide,” in Smithsonian (Oct. 2005) provided the unique perspective of Native Alaskans at ground zero of the controversy. Back in Latin America in 2008, Scott trekked to Machu Picchu via the Salcantay Trail resulting in publication of “The High Road to Machu Picchu” in National Geographic Traveler (May-June 2009). This provided a thoughtful examination of the delicate social and natural ecology of the Andes, where glaciers are rapidly melting and where adventure tourism poses tricky challenges for vulnerable habitats and archeological sites. Wallace continues exploration today. He recently returned from two expeditions into the remote Alto Tamaya, Upper Yurua, and Alto Purus river basins of Peru to examine the environmental and social impacts of illegal logging in some of the most biodiverse and culturally diverse lands on Earth. His publication is forthcoming in National Geographic.